We passed a significant milestone with Connections last Sunday night. We officially passed the $300,000 mark in funds raised by the band. Below, you’ll find some graphs, that detail how much has been raised for each beneficiary, and how much was raised each year. We are grateful to all those who come to see our shows. As we like to say, you make the world a better place, just by deciding to see a concert. And you’ve done it to the tune of $300,000, all while enjoying some of the greatest music of our time. Thanks for all you do to make Connections possible. We’re still tabulating expenses and computing exactly how many folks came to Friday night’s big show (We think: 500-600) in Allen. And we’re still figuring out just how much we raised for our beneficiaries. But one thing we do know: the heart and generosity of James Taylor helped us tremendously. In case you missed the incredible news, James Taylor (Yes, THE James Taylor) heard about Connections‘s big show with the Allen Symphony Chorus and orchestra. He sent us an autographed guitar and some concert tickets to upcoming shows. Eric Considers Running for the Door…..
All told, the items James Taylor contributed raised an additional $4,000 for our causes!! How amazing. Thanks again to James….we are so grateful to him for thinking of us. Turns out, the guitar found a good home. Dave Sherman and Beverly Sharpe ended up taking it home. I know Dave from song circles, down at the Kerrville Folks Festival. Nice that this “connection” got made. If we get some decent video of our two James Taylor songs, we’ll post those in coming days. But thanks again to Dave and Beverly….and especially to James Taylor!! 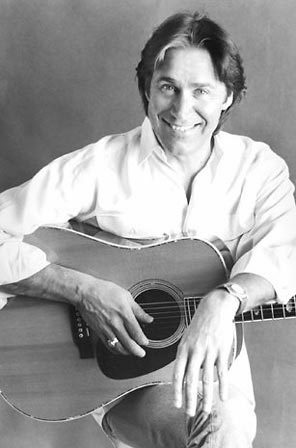 As many of you know, Connections started with Dan Fogelberg. At the “core” of what drove us to ever get our crazy band together ten years ago was a chance to play Dan’s music, and to do in a BIG way…with a big band that could recreate some of the lush instrumentation that you’re used to when you hear his records. Many of you also know that he’s my all-time favorite songwriter. But the show also gave us the chance to pull out a show-stopper from our last big show: Fogelberg’s great opus “Ghosts” from the “Innocent Age” record. The Innocent Age came out my senior year in high school. So long ago, that I had it on LP. That year, while several of Dan’s songs were charting on the radio, I was attracted to the whole thing…to the “song cycle” that was that amazing double album. Really, one of the last great concept albums, and certainly the last great double album for a generation. I’d put on “side four” in my room, as I fell asleep at night. I’d crank it as loud as I could get away with, and in the dark, I’d fall to sleep to the sounds of this mysterious and ethereal anthem. What an incredible end to that record. And what a song filled with mystery and spirit. An anthem to the past, present, and future. A song about the mystery of spirit, all around us, if only we will be quiet enough to listen. And I’d sit there in the dark of my room, learning now to feel it. If we get a nice full recording of “The Reach,” I’ll add it to this post….and I’ll likely post additional video from the show, as it become available. That’s true for Dan too. How freakin’ lucky am I?!! Could I have ever dream, listening in the dark of my room as that high school kid, that I’d ever sing that song with such a ridiculously talented cast of musicians? Last night, then, as I was singing, I was thinking that “Ghost” of my own past….but I was also thinking of all our DanFan friends/family from around the country…many of whom were with us the last time we did a big show like this. I was most definitely thinking of Dan, and of Jean and her generous support to all of us who try to honor Dan. But most of all, as I said from the stage, just after this video cuts off…. Connection is playing a show this Friday at Northaven. We’re again raising money for a good cause: fighting the scourge of Ebola in Africa. But this morning, the show became a little more poignant. 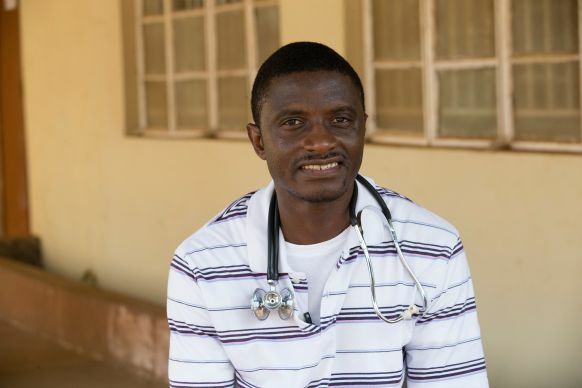 Hours ago, Dr. Martin Salia died from Ebola in Nebraska. What you may not know is that he’d been working in Africa, at our United Methodist Kissy Hospital in Sierra Leone. Recently, Dr. Salia gave an interview about his sense of calling to minister to those in Sierra Leone’s poorest neighborhoods. Friday’s show was already poignant, in that Dallas had been affected by Ebola. In part, we were pledging to fight Ebola in Africa as a way of remembering how we are now Ebola free. Now, we also remember the true sacrifice that those fighting Ebola, through the United Methodist Church and may other NGOs, truly make. Come to enjoy the music. But also don’t forget the truly important cause. Your presence Friday, and your gifts, will make a difference. Show information here. See you Friday. Friday’s Show: Please Spread The Word! Near as my next breath and yet untouchable. It was on a night many years ago, as I played that song for the first time with Rusty King, that something dawned on me. We were at a clergy retreat, and I had never met Rusty. I knew we were both Methodist ministers. He, Paul Escamilla, and John Fleming brought their guitars up to my room to play music, while other friends just played games and talked the night away. We started out playing songs we all knew, but that quickly drifted into Dan-songs. Then, into obscure Dan songs. Songs you’d only know if you had a copy of this. One of those songs was “Old Tennessee,” and Rusty not only played it note-for-note, he also matched the harmonies. I thought it was a crazy idea. Who would come? But Dan was my favorite singer songwriter of all-time. Do you think I was gonna turn down the chance to sing his music, backed by a 20-piece band? So we did the show. 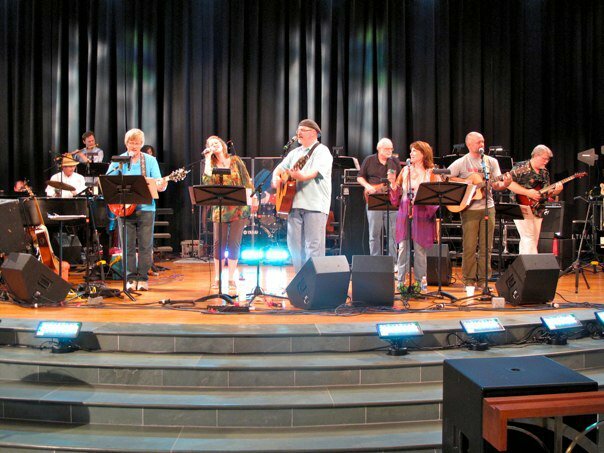 And what I assumed was pure self-indulgence on my part became two hundred and fifty people who belted-out the closing chorus of “Gambler” at the top of their lungs, and donated over $2,500 dollars to missions. That question, and the ability to dream increasingly larger “what ifs,” has kept this wild and crazy band going now for seven years now. We’ve played over 40 shows for tens of thousand of people and we’ve raised $240,000 for some really fine causes. There’d never been a public memorial service after Dan’s death. And as time passed, it seemed more and more like something needed to be done to publicly honor him. So, a group that has now morphed into the Fogelberg Foundation of Peoria was formed. Some really fine folks like Hugh Higgins, Eric Mills and Deb Jelinek worked to create a powerful weekend, where a memorial would be dedicated, and “DanFans” and musicians from around the nation could come and participate. Deb asked me if we could come. Rusty, Mike Sheehan and me were all a part of that initial year. It was incredible. We played for 300 passionate DanFans from around the nation, for his Mom, wife, and family. It was electric. 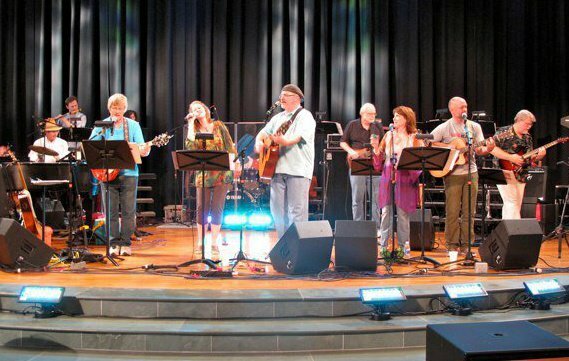 So our little tribute band had led to being part of the very first “Fogelberg Weekend,” and new “connection” with souls around the country who keep the “legacy” alive. Time passed. We kept doing shows. Mostly non-Dan shows, truthfully. (I think we’ve done the Fogelberg show five times?) Rusty got a new job in Allen, where he not only works for the church, but also with the Allen Symphony Chorus. The result of that craziest “what if” yet was last Saturday night at the Allen Performing Arts Center. And so, the Fogelberg Weekend in Allen came together. So, what do we call last Saturday? 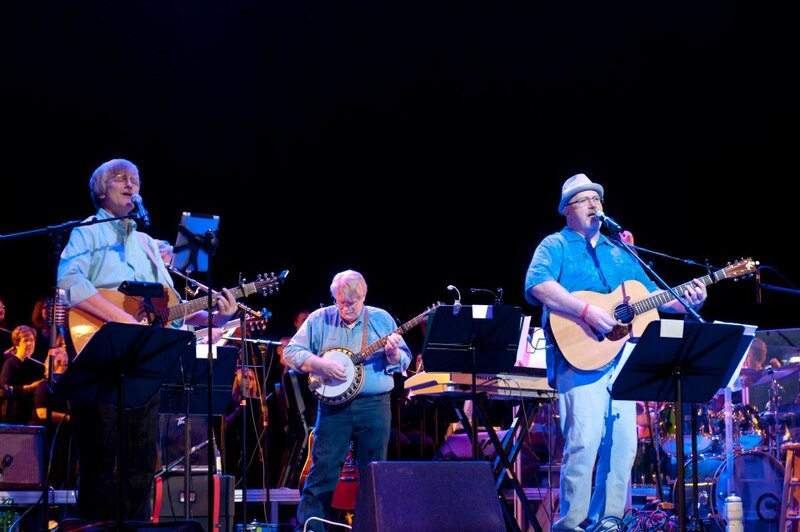 What do you call a Tribute Show to Dan Fogelberg with Connections, a 25-piece orchestra, a 50-voice chorus, a thousand people listening, DanFam and musicians from around the nation, AND Glen Spreen? First, thanks to Connections and our core members. Thanks to the DanFam members who spent their own money/time to drive/fly to Dallas to be with us. It meant a great deal to have you here, and we’re really pleased you got to be a part of it all and see what we do. The “connections” are now even stronger! Special thanks to Diane Panasci, who helped host a whompin’ load ‘of these folks. Thanks to the Tribute Musicians from around the nation. Thanks to Donnie Mills, Jay Hennesey, Steve Rodman, Bob Ritter and Mary Bomar, Tim Pastor, and Lee Giardina-Foran. Thanks for spending your own money and time to fly/drive here, and share your talents with all the folks in Dallas. It meant a lot, especially to me, Rusty, and Mike to have you with us. Thanks to our own members, Mike Sheehan and Paul Simonson for doing yeoman’s work all through the Friday night show and the Saturday one. Jesse Plymale sat in on keyboards during all of the Tribute Show too. Special thanks to Sheldon Felich. Sheldon organized Friday’s show, and brought all the tribute artists together, played with us Saturday, and behind the scenes has done so much to continue the work of keeping Dan’s musical legacy alive, including our show. Y’all should check out his great tribute band too. Thanks to Deb Jelinek for all her continued support. 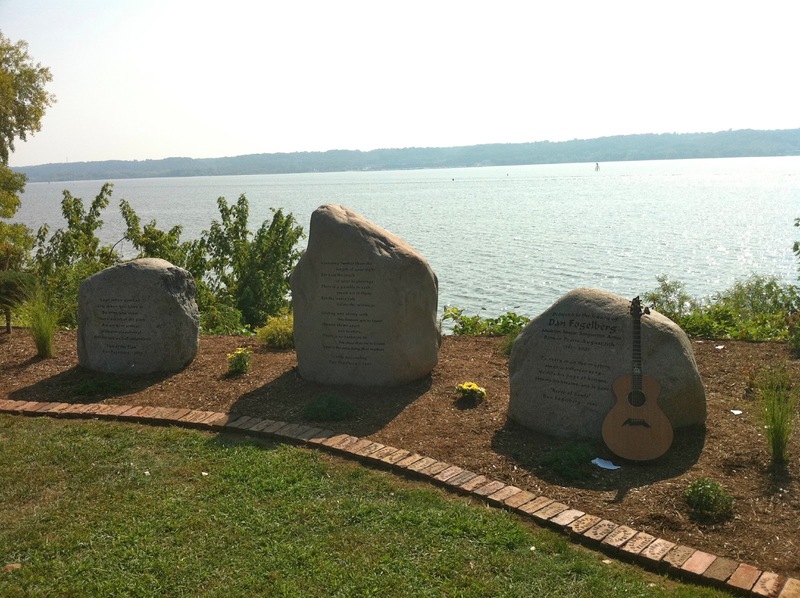 Thanks for singing with us, and for being a part of the Fogelberg Foundation of Peoria. Thanks, from afar, to good folks like Hugh and Eric Mills. We love you guys. Thanks to the Allen Symphony Chorus and members of the Allen Philharmonic Orchestra for also being a part of this big dream. Thanks especially to all the behind-the-scenes work of Kathy Litinas, and other chorus members who worked hard to staff the Welcome Party. Thanks to Caryn Fecht who directed the chorus during the show. 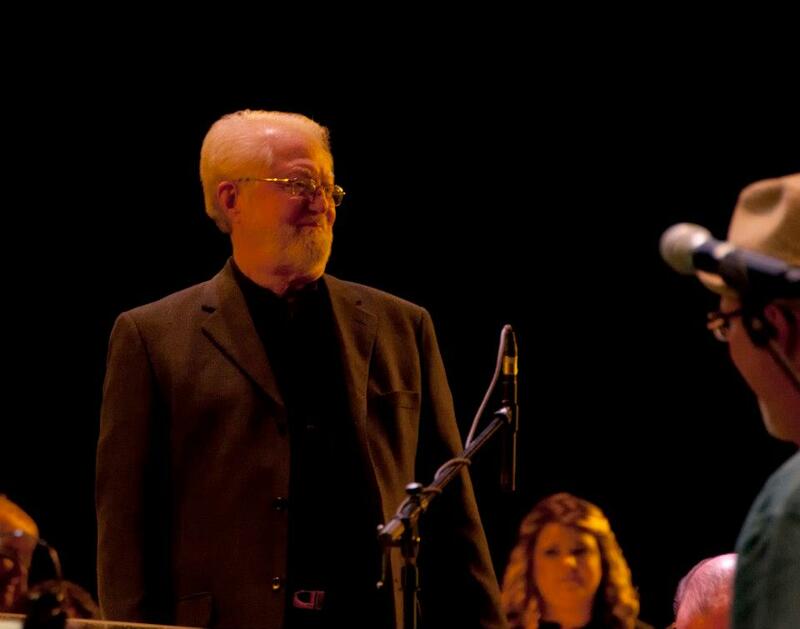 You can’t imagine what a thrill it was for you to be with us, and to have you conduct our orchestra. You are a kind and wonderful spirit, and we’re so pleased you seemed to enjoy the night as much as we did. We’re pleased the crowd gave you that well-deserved standing-O. Thanks to James Miller, who wrote a whole ton of charts for this show. It was all wonderful, and the music wouldn’t have been there without your work. Thanks to First United Methodist Church of Allen. They deserve copious and overflowing thanks. FUMC Allen put thousands of dollars into this production. They contributed the resources of several of staff members. They did publicity, provided dozens of volunteers for meals, set-up, refreshments, and many other behind the scenes tasks. All of you deserve much of the credit for this success. Thanks to our friend, Todd Harris, and to bandmates Brian McPherson, Rusty, and all the rest of the staff there. Keep throwing out those crazy, “what ifs” my friend. Finally, all thanks to God. Thanks to God for allowing us to continue this incredible work. With this show, we raised $12,000 for United Methodist Committee on Relief, and work they are doing to alleviate the suffering of Hurricane Sandy. We’re grateful that God keeps opening these doors for our band. We’ll try to keep walking through. Thanks to Jean Fogelberg for being a gracious human being. We miss Dan a lot. Those of us who are “DanFans” miss him in a way that tugs at the gut. Those of us who are privileged to play his music –across the nation, as solo acts or in large bands– we find ourselves with the feeling that we’ve been given a “legacy” to maintain. It’s a calling to make sure that others keep hearing the incredible music of this incredible artist and soul. I’m so warmed by messages I got –one while we were still tearing down just after the show– from audience members who’ve said, “I just downloaded some of the songs I’d never heard.” They were downloading Dan’s music to their phone on the way home from the show! That makes me smile. I’d hope it would make Dan smile too. I know I speak for me, and probably for everybody else on stage during Saturday’s show, but we knew in the moment that it was a one-of-a-kind night. b) I want to sing it. Without drifting too far away from the general point of this blog, let me opine that “The Innocent Age” was perhaps the last record of its kind. Very few records would ever again be “double albums.” Very few records by singer-songwriters would ever again have that impressive a combination of chart-topping hits and richly artistic numbers. “Ghosts” is an amazing song. The past, the present, the future, all morph into one in that song. And, I’d like to believe, all three came together on that stage, in that moment, last Saturday. During the whole show, but especially during “Ghosts,” I really felt like that happened. Like we were all aware of just how special this was, and what an honor for each of us to play our parts. It felt like we left it all on the stage. For me? In that moment, I recalled all those nights, listening this song in the dark of my high school room. I thought of all the beautiful souls who love Dan’s music, gathered into that hall for one evening. Now and then, past, present, future all do come together in one Kairos moment. For all of you who were a part of this special weekend…. (2) First, through the “FM” soundtrack, and “Gambler.” That led to buying “Souvenirs,” to hear the original context. Then, I went back to “Home Free” and worked my way forward in time. (3) This is not to say that Dan did not have success after this. He did. Nor is it to say that others have not had it since. They have. But in the early 1980s, pop music was just about to change drastically. The era of the singer-songwriter dominating the airwaves of pop radio…which you can trace all the way back to folks like Dylan, and then through folks like James Taylor, Carole King, Cat Stevens, Harry Chapin, Jackson Browne, Stephen Bishop…even bands like Eagles…that era was drawing to a close. Again, all these artists continue to produce excellent work to this day. That’s not what I’m saying. What I’m saying is, the combination of their artisanship being rewarded with hits on the pop charts…that era was drawing to a close. Dan, I have argued many times, was the last of the great American singer-songwriters on pop radio, and “The Innocent Age” was the last great singer-songwriter record. It’s a tour-de-force, and a fitting end to that era. He didn’t intend for it to be this, but with 20-20 hindsight, we can say this now. It’s late at night, after the Fogelberg Tribute Show in Allen tonight. We raised over $12,000 for the relief of Hurricane Sandy. 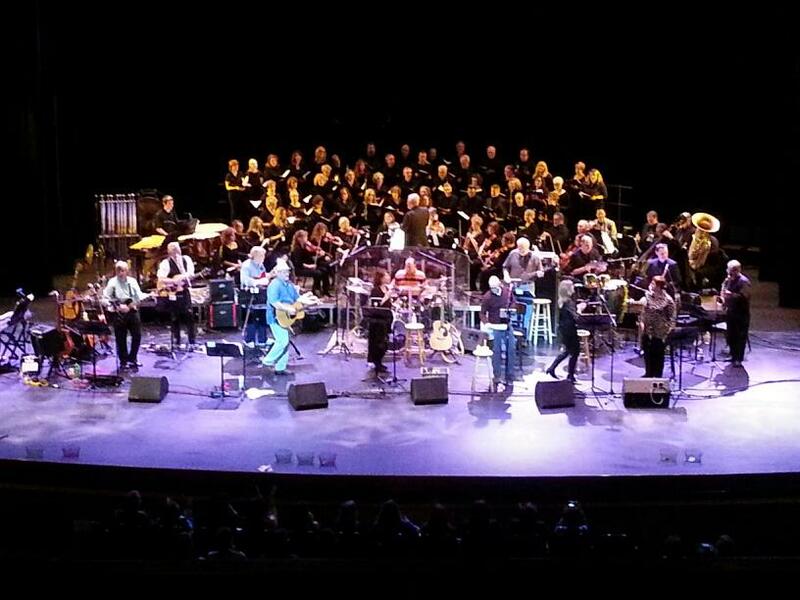 80 musicians did our best to honor the musical legacy of Dan Fogelberg. If you were there, tonight, or last night, please leave a comment HERE at the end of this blog. Yes, some of you have probably already commented over on Facebook. But those comments sort of vanish away forever. And we’d like to be able to keep your thought in a file for future savoring. What feedback for any of us band, orchestra, chorus folks do you have? Thanks in advance for leaving your thoughts here. One hundred thousand dollars is an awful lot of money. 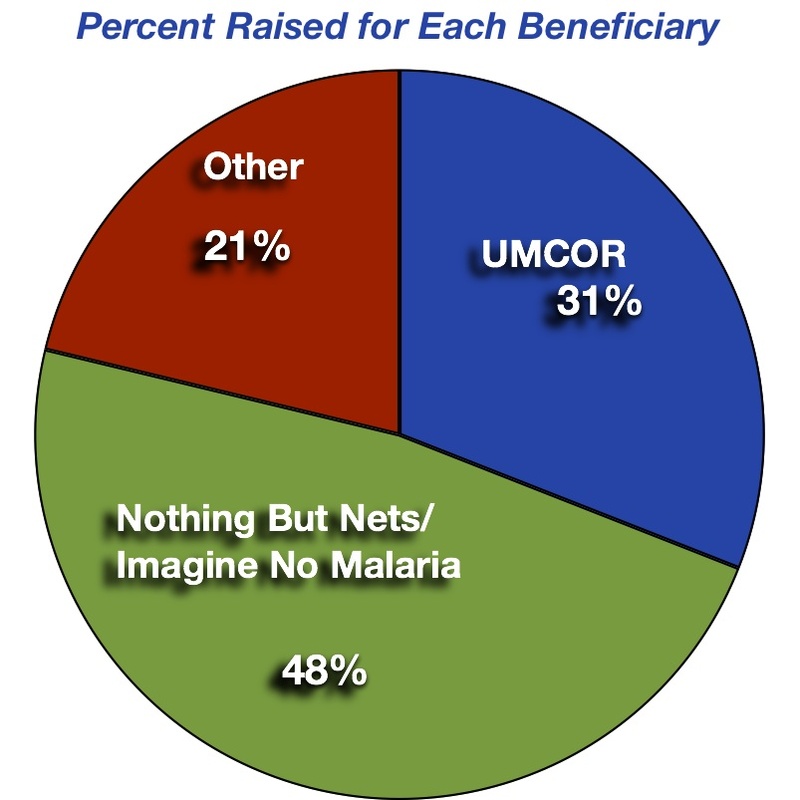 Connections has raised over $100,000 to eradicate malaria from the face of the planet. We passed this milestone last night, at our Denton show. We’re grateful to the good folks in Denton for putting us over the top, and for coming out to enjoy the great music. It’s grown into a beautiful thing that allows us the chance to play great music for thousands of people, provide a quality evening of entertainment, and raise money for several good causes. You can learn more about our band, its history, and its mission, by clicking here. Mainly because it’s an absolutely preventable disease that still kills far too many people, mostly on the continent of Africa. When we began this work, it was to directly support a project called “Nothing But Nets,” which was a project focuses exclusively on providing bed nets for Africa. Within a few years, smart folks realized that bed nets were absolutely an important part, but to literally eradicate the disease, it would also take prevention, treatment, and education. Thus, “Imagine No Malaria” was born, our current beneficiary of our anti-malaria shows. The ambitious goal of this project to literally eradicate the disease from the face of the planet. It can be done. It’s a joint project of our own United Methodist Church, the United Nations Foundation, the Bill and Melinda Gates Foundation, and several other very worthy NGOs. We’re honored to be partners with them in this effort, and to be doing our part to help. That means that, likely, four people have died of this preventable while you read/watched this here. In the time it takes to play a Connections’ show, 113 people die. But, here’s the awe-inspiring thing. In terms of bed-nets, the funds that Connections has raised in our shows, have saved 20 to 30,000 lives!!! We’re so deeply grateful to be a part of it all. If you’ve never contributed and are moved to do so, click here to donate online right now. And, last but most definitely not least, Kaufman County. This last group absolutely deserves special note. 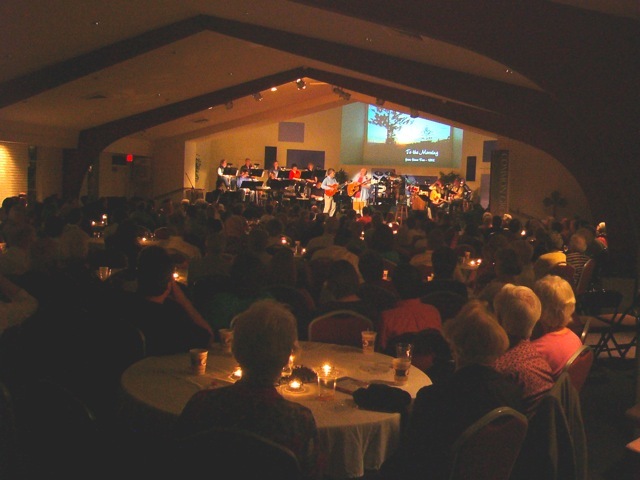 In two concerts, the good folks of Kaufman County, mostly small lakeside churches, have raised more than $25,000!! That’s one quarter of all we’ve raised in this effort. Copious thanks to them, and especially to our friend and colleague, Eston Williams. Here’s the crazy thing. We’re not done celebrating great milestones. 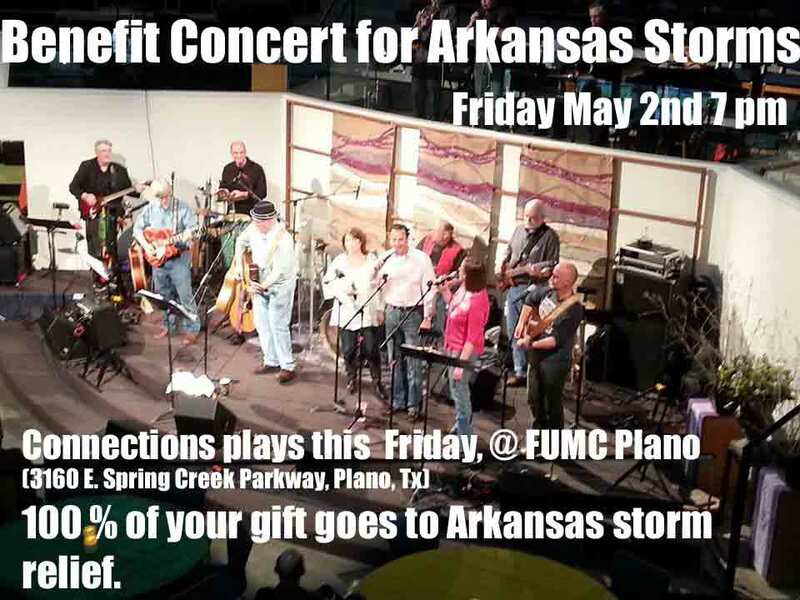 In fact, at our next show in Allen, we’ll very likely pass two more significant fund-raising milestones. Stay tuned. And come and see us. And thanks to God, and all of you, who have supported us along this amazing journey. We’ve got some year-end stats now for Connections in 2011. And, the results are pretty amazing. It was clearly our best year yet. This was on the back of our single-largest concert ever: “The Concert for AMK,” last June. That one show, by itself, surpassed our fundraising for every other single year in our history. Pretty dang amazing. 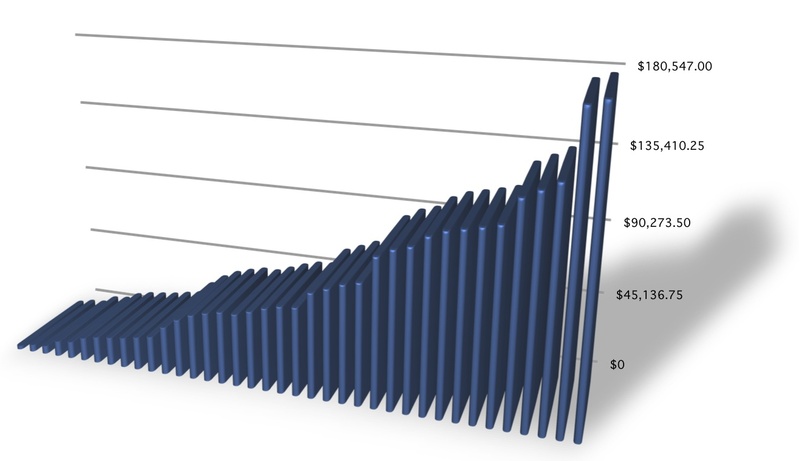 This first graph shows our all-time funds raised over time. As of year-end, we’ve raised $180, 547!! 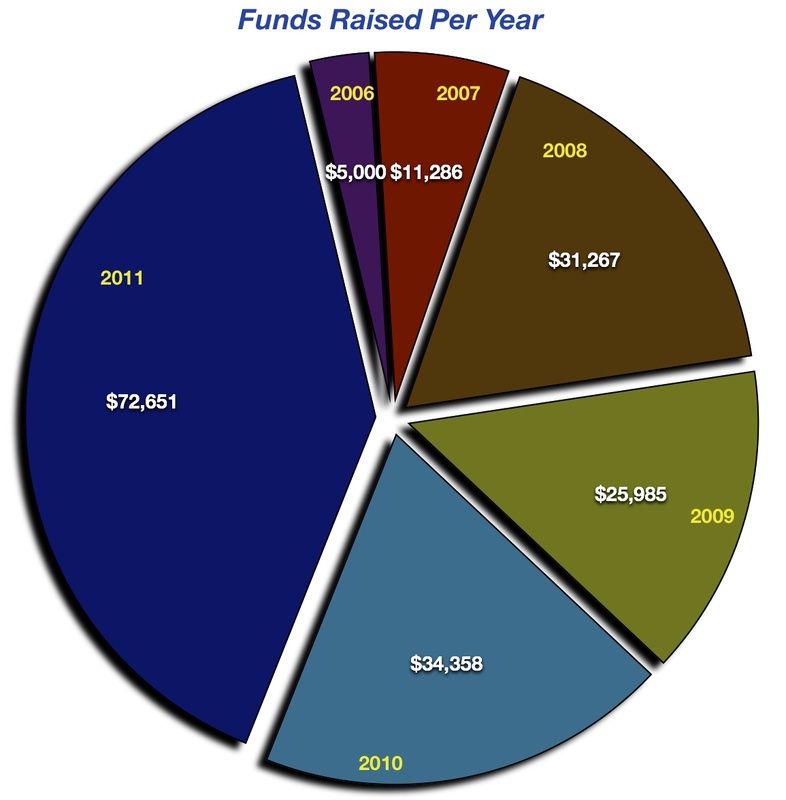 As you can see, 2011 blew the roof off of every other fundraising year we’ve ever had. The “Concert for AMK” was. of course, the thing that more than doubled our fundraising over every previous year. However! When you factor out the “AMK Show,” 2011 was still our second largest fundraising years ever!! Taking out that show, for an apples-to-apples comparison with other years, not only was 2011 our second largest fundraising year, but it was only $350 from being number one!! So, it was an incredible year, no matter how you run the numbers. Check out the dates here, and come out to see us. Connections continues to be an incredible gift to all of us in the band. We’re grateful to be able to share great music, offer fun shows, and raise money for these incredible causes. We are profoundly grateful to the thousands of people who, simply by coming to see our shows and enjoying some music, make a difference in the world. 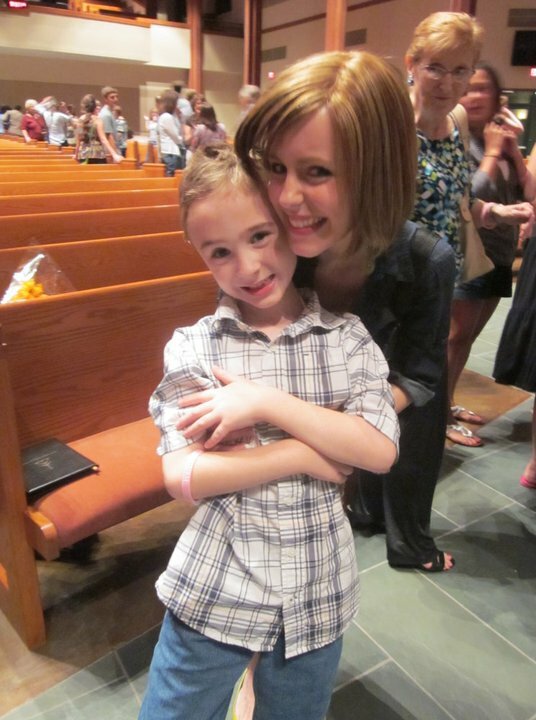 As you may have heard, Monday’s show for Ann Michele King was an amazing outpouring of music, love and community. 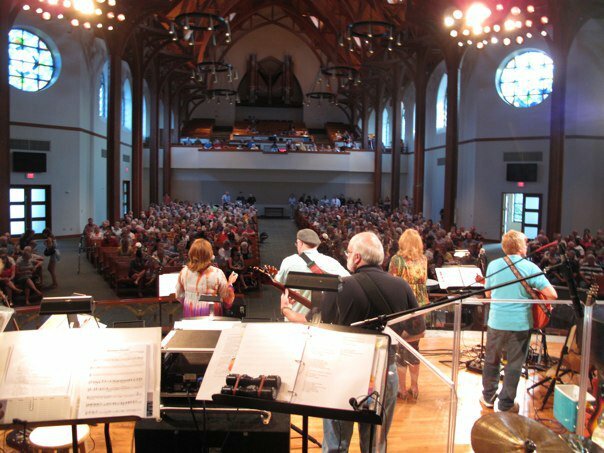 More than 1,100 people packed the sanctuary of FUMC, Richardson for this special show, benefiting Ann Michele and the King family. It was just an amazing night. Most amazing of all was the outpouring of support. At this point, we’re estimating at least $27,000 dollars raised to help with medical expenses for Ann Michele, as she continues her seven year battle against cancer. What a great privilege to be able to be a part of this special show. What a crowd. What support for an incredible family, and incredible woman. I’m privileged to know Ann Michele and completely inspired by her faith and her courage facing her challenges. I know everybody feels the same way. Of course, we all love Rusty too, and a part of why we did this show was to be there for our band-brother, and musical director. This one was for you too. Copyright Connections Band © 2017. All Rights Reserved.